President Nicos Anastasiades will try to secure US support for the rights of the Republic of Cyprus in its exclusive economic zone (EEZ), similar to that expressed by the EU, during a tête-à-tête he is expected to have in Jerusalem next week with US Secretary of State Mike Pompeo. Speaking to CNA, Government Spokesman Prodromos Prodromou said a bilateral meeting between Anastasiades and Pompeo is expected to take place on the sidelines of the Cyprus-Israel-Greece trilateral summit, in order to discuss Turkish threats in Cyprus’ exclusive economic zone, among other issues. “The EU reiterates its solidarity and support for the rights of the Republic of Cyprus in the EEZ. Therefore, the president will seek to have something similar from the United States” Prodromou said, while referring to statements made recently in Brussels by Federica Mogherini, the Union’s High Representative for Foreign Affairs. 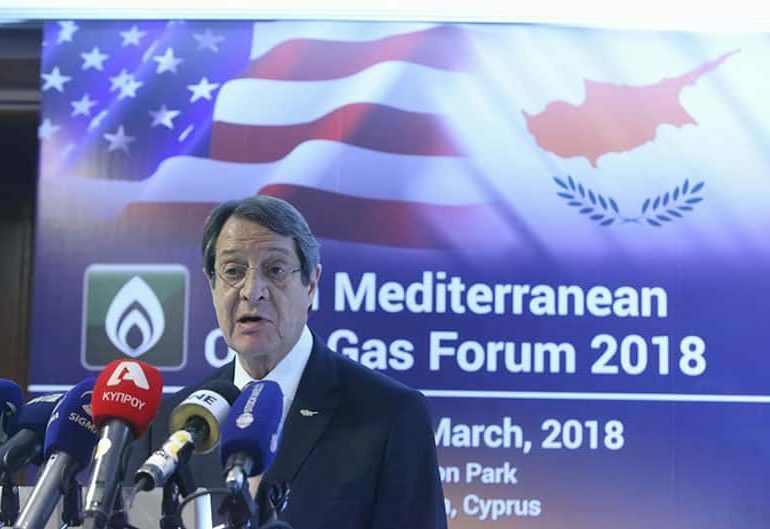 The government spokesman noted that a number of other bilateral issues were expected to be on the agenda at the Jerusalem meeting with Pompeo, such as ExxonMobil’s presence in Cyprus’ EEZ, as well as the arms embargo on Cyprus, which the US imposed back in 1987 to avoid hindering reunification efforts. As for the trilateral summit, Prodromou said it would focus mostly on energy security issues, and noted that the meeting was taking place shortly after the hydrocarbon discoveries by ExxonMobil in Cyprus’ EEZ block 10. Trilateral cooperation was a reality and was constantly evolving, Prodromou said, and added that it would provide partners the opportunity to follow developments in relation to energy, security and geopolitics, in a coordinated manner. He said Pompeo’s presence constituted an upgrading of the trilateral cooperation. “This conveys the message that the US takes into account the role that all three countries play for stability and security in the region” Prodromou added, noting that US interests and the interests of Israel, Cyprus and Greece were aligned. As for the signing of an interstate agreement on the EastMed pipeline, concluded last December in the trilateral summit, in Beer Sheva, Prodromou said that any developments were likely after the European elections. Meanwhile, on his Twitter account on Sunday, Ambassador of Israel to Cyprus, Sammy Revel, wrote that “at today’s Cabinet meeting PM Netanyahu`s remarks included: This week American Secretary of State Mike Pompeo will arrive in #Israel . Together with him I will also meet with the President of #Cyprus & PM of Greece 2 discuss laying of gas pipeline from Israel to Europe”. Turkey and the Turkish Cypriots focus on political equality only, which is one of the six parameters, set by the UN Secretary General at the 2017 Conference on Cyprus, at Crans Montana, Prodromou said. “We don’t hear anything about the issues of security, or territory,” he added, noting that this was not an encouraging sign.